Today, we decided to head out of the house early. Daddy and I wanted to take both of you to the Journey Through the Body. We had heard about it many times in the past, but for one reason or another had never gone. We arrived just after it opened for the day. We immediately ran into the first exhibit all about the intestines and kidneys. NHL, you were fascinated with how long the intestines in our body were. Then you and Daddy both were able to touch real kidneys.You thought it was gross and squishy (not my kid)! Meanwhile JSL, you were not a happy camper.You were not sure if you wanted in or out of the stroller. Of course, I think a lot of this had to do with the costumes that were wandering about. There is just something strange about wandering cows, chickens, grapes, bananas, apples, peas and corn. From here we went into the main area that housed most of the other displays and things. In here, both of you learned about the heart, lungs, food pyramid, brain, teeth and more. 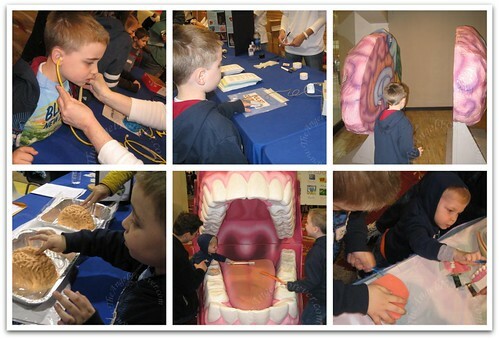 After we finished in the main room, we went upstairs to learn about the ear and bones. You were both mesmerized by the walk though ear/hearing display. 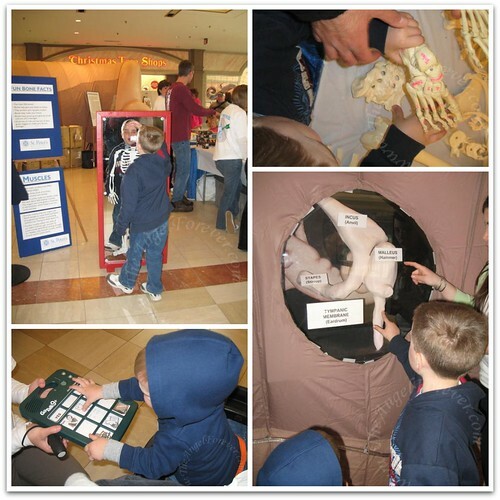 As a science teacher, I loved all of the hands on activities. It was geared perfectly to kids like both of you and the volunteers there were amazing. 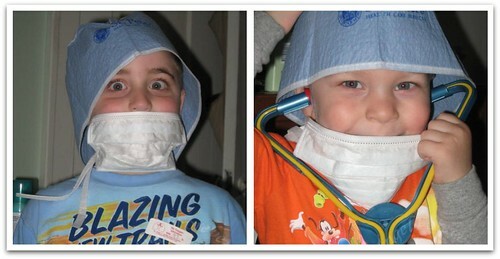 When we got back home, both of you took our the hospital masks and things to use with your doctor kit. Perhaps a career in a medial profession will be in your future. Remember to always follow whatever your dreams are and you can make them come true. That’s awesome! What a great way to play and learn!